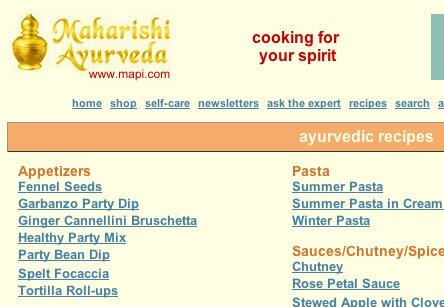 Fran's House of Ayurveda: Recipe website! I'd like to direct you to a great Ayurvedic recipe site that is full of healthy, tasty Indian and international recipes. The Maharishi Ayurveda website is the source of my links to the Vata, Pitta and Kapha food guidelines and Ayurvedic lifestyle tips. Lo and behold they also have a whole section on recipes! The recipes are all vegetarian, but they are not categorized according to which ones are Vata-, Pitta- or Kapha-friendly. * My suggestion is that you get familiar with your dosha food list (see below) so that when you check out recipes you can know how to adjust them to suit your dosha (for example, if you are a Kapha or are trying to lose weight, you know that recipes containing 3 teaspoons of oil or ghee should be reduced to 1 teaspoon; if you are a Pitta and a recipe calls for ginger and chilis, you know to omit those or replace with coriander and fennel; if you are a Vata and the recipe calls for raw cabbage and cauliflower, you should steam or cook them). Check it out and be inspired as you look through them! * For guidelines on your mind/body type, go to my post on How to eat in an Ayurvedic way and see the links under "Eat according to your dosha". Ayurveda, the Science of Life, a sister science to Yoga, offers wonderful knowledge about living a healthy, balanced lifestyle. Ayurvedic cooking has a reverence not only for nutritious food and the health benefits it can provide, but also for the manner in which it is prepared. The belief is that the simple act of eating creates a ritual of celebration. This cooking class introduces people to vegetarianism and how to choose and prepare foods according to Ayurvedic principles. Preparing balanced meals the Ayurvedic way includes a unique and highly satisfying combination of six tastes: sweet, sour, salty, pungent, bitter and astringent. It’s a class about nourishment on all levels - physical, mental and spiritual. For over ten years Nalini Mehta has been actively involved with the food industry as a caterer for private events and gourmet food stores in NY. She has cooked in the kitchens of Candle Cafe and Hampton Chutney, and has been an Instructor at the Natural Gourmet Institute in NYC since 2004. A vegetarian herself, complemented by her belief in Ayurveda and Ayurvedic cooking, Nalini has a reverence for nutritious food, for the manner in which it is prepared as well as for its health benefits, believing that the simple act of eating creates a ritual for celebration. Thanks for this post, even though I'm not that good at cooking it will still help me a lot. I'll bookmark your blog and I hope Cafe24 extension will release this kind of cooking extension. Thanks again!. I use many of your recipes because I follow a purer diet than most people, I would love to try your chocolate zucchini cake, but to do that I would be substituting my version of 4 ingredients. Would you be so kind as to let me know if you think it will work and still result in a delicious cake? If you think it's worth a try, would you also recommend which substitution sounds best in the case of having two or more suggested above? Hello to the last Anonymous comment! I'm very happy to hear my recipes are helpful in your healthy way of eating. I think you could try the substitutions you suggested for the chocolate zucchini cake, but if you can find carob powder use that instead of melted carob chips in substituting cocoa. Oat flour will be heavy, but try it if you can't do barley flour or spelt flour or kamut flour instead, these are great for baking. Because your sweeteners are liquid, you'll have to add less (coconut) milk or you'll have a very wet batter. Hope this helps! Ayurvedic products are very important and useful in maintaining overall wellness of a person.